I would have to say yes and no. Yes because it can be a little overwhelming and no because there is something for everyone. Recently we were able to visit The Counter in Irvine. They are a burger âchainâ with headquarters in Culver City. The one we visited in Irvine has a simple but clean dÃ©cor. There is a counter/bar and I would guess about fifteen tables. It is very open and lively. We went for lunch on a Saturday afternoon and the place was full. The Counter is a little different than most hamburger restaurants. When you sit down you get a clipboard with a check sheet and a menu. 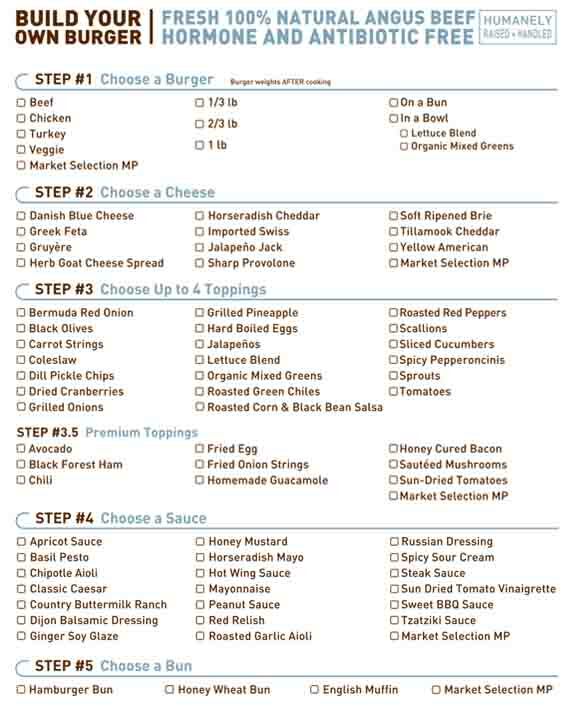 The check sheet is how you order your burger. You pick your type of meat from beef to lamb to turkey and so on. Then it is your cheese, and there are at least twelve to choose from. Now the fun part, the toppings, which includes about 30 items! If you are done with this part then you are on the home stretch. Next is the sauce and there are 21 of those and finally the type of bun. I am tired just thinking about it! They have some prebuilt selections if you want the easy way out. I chose the Angus beef 1/3 pounder hamburger with Danish Blue Cheese, grilled onions, roasted green chilies, lettuce blend, bacon, on a traditional hamburger bun with a side of country buttermilk ranch. The hamburger was cooked a perfect medium. Wish I could have ordered it medium rare but they will not go less than medium. The one problem I had was I chose too many big flavors. If I had picked something other than blue cheese it would have been better or if I had done less other stuff and just blue cheese it would have worked as well. The burger turned out good. Not the best burger I have ever had but still good. Kim got a turkey burger with soft ripened Brie, sautÃ©ed mushrooms, organic mixed greens, and dried cranberries, all on a wheat bun. She also got a side of their roasted garlic aioli. The turkey burger was very nice. I was very glad they put as much effort into their non-beef selections. Her combination worked right on. We both really liked hers. The cranberries were a nice touch. The cranberry texture and flavor added a lot to the overall masterpiece. We had to try their French fries and onion rings. I am sure you would agree these are as important as the burger itself. We were not disappointed and we will get them both again! They stayed crispy throughout our meal and we really enjoyed the seasoning. The BBQ sauce and buttermilk ranch dips were also very good. Overall we had a good lunch. Like I said the place was very simple inside. I am sure there are a lot of people that like that style. The people serving us were friendly. I would go for a burger again, only this time I will narrowed down my choices before I get there. I’ve been there a few times. I’d agree with your review with one exception. I think the number of choices for the burger is just about right. A lot of variety in the options. Anymore and it would be too overwhelming. One tip, to go lower cal, get chicken or turkey and order it on greens with no bun. With the right amount of toppings it makes a nice salad. Great tip!! Never thought of making a salad!